Today I am SUPER excited to bring you Christie, from Letters from the Nest. She is an incredible writer, as you soon will find out. I have had the privilege of meeting her in person, in fact she was one of my roommates at the Influence Conference this past weekend, so she had to put up with my crazy antics for an entire weekend! She has the sweetest heart and has a beautiful desire to love and serve her community. I am very inspired by Christie, and honored to be able to call her Friend. Grab a sweet tea and cozy on up for this good read. Christie is a mother of 3, cop’s wife, and Junior Mint lover. She blogs at Letters From the Nest and is a columnist for her hometown newspaper, The LaFollette Press. Christie and her family reside on a farm in the Appalachian mountains of East Tennessee, where sweet tea is served at every meal and hospitality is second nature. She also blogs over at the Konxville Mom Blog. KIDS JUST NEED TO BE BORED. There. I said it. There is a creative brilliance that comes with boredom, a primal urge to fill that white space with something inventive and this boredom promotes ownership of unplanned blocks of time. In other words, FREE PLAY ROCKS. "What are we doing tomorrow?" "What are we doing next?" When there is an urgency for the "next fun thing," it is a call that we need a few at home days. Days where there are zero events on the calendar. Days where they just PLAY. Explore. Create. Pretend. The days in which our children are at their personal best are the days in which they can simply be kids. Where playing with a basic sheet of paper and pack of crayons turns into digging through the recycle bin for empty cardboard boxes and the next thing you know? They've created a bed for our cat. We have had to create a "no sticks in the house" rule because sticks serve as swords, fairy wands, and fishing poles when that time is free for them to invent such creations. Five gallon bucket lids become bases for kickball, digging in the dirt is actually a quicksand pit, and the mailman is really a fire breathing dragon. And sandwiches somehow taste better when you are swinging. Kim John Payne, in his book, Simplicity Parenting, states that "nature is the perfect antidote to the sometimes poisonous pressures of modern life." Simply stated? 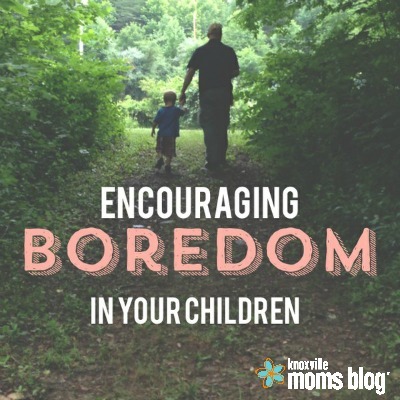 Being bored can be the best thing EVER for your children. 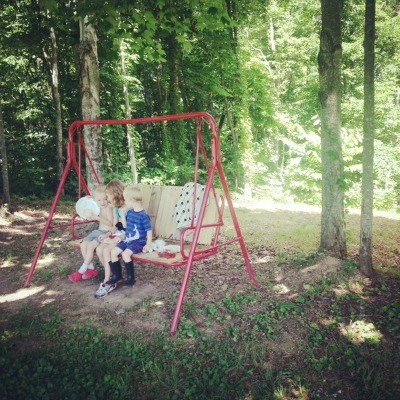 Allow them to play freely and watch the magic that unfolds. (PS: And if you want to see how our family creates a balance between busy days and simple ones, read more here ). Agreed! My daughter is just beginning to engage in imaginative play and it is incredible to watch it unfold. Wouldn't be possible without those "bored" moments!